Watch for... Martinez drinking beer when he's on flying duty. Theora's personnel file and tale of her unhappy childhood. Our first look at tele-politician Simon Peller. The first episode of the ABC series to be aired was a later production number that shows all the hallmarks of being rushed to completion. We're 20 minutes into the future in a Fringer wasteland at night, with montage-stacks of TVs showing eerie sequences of images. A Fringer woman mutters instructions into a microphone - to whom, we don't yet know. At first, it was skateboarding. Then it was boarding on crudely motorized skateboards. Then it was a rougher street sport where the accidental collisions became deliberate moves as skaters worked to knock each other off their boards. And when the sports promoters got ahold of it, it turned into an underground blood sport where the "rakers" are armed with steel claws to enhance the damage while gamblers wager on their bouts. A young "raker" stops to look at a TV, and finds himself talking to Max. Max has become concerned about the homicidal madman he sees running around and laying waste to 100 people an hour. Since the whole world is television to him, he doesn't realize that "Missile Mike" is a violent TV show - part of Network 23's children's programming - and not reality. 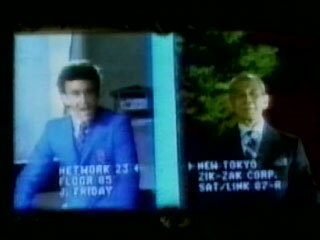 With his new control of Network 23's computers and broadcasting, he pops up here and there, querying the viewers about the effects of this mindless violence on the mindless. When Theora receives a frantic phone call from her sister-in-law Winnie, she comes running to help only to find that Winnie will not tell her where her estranged brother Shawn is. Theora traces him to the posh restaurant where he works, only to find he has lost his job as a busboy... and to get an ugly hint that he's involved with raking. Theora's abrupt departure from her station leaves Murray, out of practice and inept, to cover Edison Carter on a story - an attempt to catch the "Bureau Burner" arsonist. Murray's clumsiness with the newer equipment causes them to fail. Theora's unexplained departure infuriates Murray, who orders her put on suspension or fired, even though Carter objects. Concerned, Carter tries to convince Bryce Lynch to make an end run on Network 23's security and show him the security tape of Theora at her workstation. Bryce dithers; suddenly the material is up on the monitor, courtesy of a chuckling Max Headroom. With that and a look at Theora's personnel record, which mentions several unknown items of interest including her brother, Carter takes off in search of her. In the meantime, Shawn has been badly hurt in a raking match. When Carter catches up with Theora at the restaurant, just as she's learned that her brother no longer works there, she is angry at being followed. She tells him that she lived for 12 years in state homes, and was adopted but left Shawn behind - something for which he's never forgiven her. It's then that we find out that Jack Friday of the Network 23 sports division has shown the sport to Ped Xing, the head of the network's biggest advertiser, the Zik-Zak Corporation. If Zik-Zak is interested enough, they'll build a chain of stadiums for raking teams... and give Network 23 exclusive worldwide coverage, with corporate advertising, to replace the declining "Missile Mike" and other violent shows. And legislator Simon Peller is being convinced to help legalize the sport. Theora goes back to her console as Carter heads into the wastelands to find Shawn. At the Ouzo Bar, he hooks up with a tough street rickshaw driver, Rik, whom he apparently knows from prior adventures in the streets, and together they set off to find one of the clandestine raking matches. Rik advises Carter that Shawn is in big trouble if he's connected with raking. They set out to find another raker to tell them where the current matches are being held. They find one, and get into a match, only to find that the injured Shawn is losing a brutal match. The promoters have been paid by Zik-Zak and are slipping away, leaving the problem in Network 23's lap. Carter jumps in with his camera but is knocked down and the camera damaged. Rik finds a television with Max on it, and via the two-way link (authorized by a watching Cheviot), Max takes the ugly story live, ending raking as a promoted sport and as a Network 23 program. Theora evidently mends fences with her brother and both she and Carter are made uncomfortable by Winnie's suggestion that they start a family, too. Although we got glimpses of the raw post-apocalypic wasteland where most people seem to live in the first episode, this is the first time we get a detailed, wide-angle look at life "20 minutes into the future." The "fringe" is a rough, grim place where many appear to be homeless or living in patchwork shelter, and rats are caught for food. More than ever, it looks as if society consists only of a vast underclass and the lords of television and advertising ruling them. Brief references in prior episodes to TV shows "The Rat Catchers" and "The Rat Killers" become understandable as we're shown rats loose on the streets and hanging up on food carts. Shawn's comment confirms that the vast piles of freely provided television sets have no off switches. Even more interesting to hear is that the "Bureau Burner" arsonist is burning the Tax Data Center to protest "the new TV tax." This seems to be a leftover of the British influences, since TVs are licensed (and taxed) in the UK but not the US. The network control center, at least the one where Murray and Theora work from, is on Level 40. Among the things the glimpse of Theora's personnel file reveals are details about her brother, Shawn Jones, who works as a busboy and lives in the Metro Projects, Block 555 A. Even more interesting are the notations that her mother is deceased and her father is unknown. Add in her comment about "twelve years in state homes" and Theora's personal history appears to be very much at odds with her polished elegance. Raking appears to be one-on-one matches. The referee drops a wooden "flag" and one raker must take possession of the flag to win... by disabling the other raker. Rik has a motorized rickshaw in this episode, but only a foot-powered one in "Body Banks." Depending on which order the episodes follow, he's either come up or gone down in the world... or perhaps has more than one "cab." The mentions of "New Tokyo" and "Novo Zurich" raise questions about what's happened to the world since our time. If Simon Peller is Network 23's tele-candidate, as we find out in later episodes, it is peculiar that Murray and Cheviot are so quick to take the story public. Cheviot's presumably high-level access code for the two-way sampler is "Cheviot CT0011." Thanks to BlankChrissy for a key actor ID in this entry! This episode uses a polished version of the opening credit sequence, but still no dialogue. Max: "Hi. I'm doing a survey on this kind of mindless violence and its effect on the mind-mind-mind-mindless. Do you believe all that killing is necessary? Does it s-s-s-scare you?" Max: "Yes! Yes! You with that plank on whee-whee-whee-whee-wheels. What is its effect-t-t-t on you?" Raker: "You can see me?" Max: "Well. That was a fas-fas-fascinating discussion and I think you've answered my question. Thank you-you-you-you, thank you... for your help." Announcer: "Kids, ladies and gentlemen! Welcome to Sport Ochias[?]! This... is... raking!" Promoter: "Raking is gonna be very, very big!" Jack Friday: "And we have a chance to come in on the ground floor, I mean, this could be big! ...bigger than Scumball!" Carter: "God, I hate waiting for something to happen!" Murray: "It's quieter than the grave out there." Theora: "What do we have as standby?" Murray: "'Producer Dies of Boredom.'" Carter: "...you may not realize that here in the Fringes, people eat what they can catch." Shawn: "You never shut up, Winnie. Just like that stupid TV, built with no way to shut you off." Shawn: "I don't have a sister any more." Theora: "David? Sit down. Link to Edison Carter." Theora: "Don't worry about it." Theora: "It's okay - it's dead, there's nothing. You have control." Murray: "All right, talk to me, somebody... wake me up!" Max: "I don't want to keep - I don't want to keep - I don't want to keep chewing on an old bone, but..."
Max: "...I'm talking about lives! Just how da-da-da-da-dangerous is this person?" Murray: "Does anybody know what he's talking about?" Max: "I'm talking about this guy-guy-g-g-guy with the inexhaustible ammunition s-s-s ammunition supply, ninety-nine lives and an urge to use 'em all up!" (battle sounds) That-That-That-That's who I'm talking about! Controller: "Murray! Murray, we have fish!" Max: "Why is he trying to find Theora?" Bryce: "I guess... because he's fond of her." Max: "Is fon-fon-fon-fon is fond the same as... fondle? Fondle?" Bryce: "How should I know?" Carter: "Newsroom surveillance tapes of a controller's output are high-security confidential - they're very sensitive about giving out any of that information." Carter: "How did this happen?" Max: "Maaax. (giggles) It's great. Flip-flop!" Bryce: "I didn't know Theora had a brother." 'The Fresh Start' Terminal: "Good evening, Mr. Carter. What would you like to drink?" Carter: "I'll have a scotch with ice, and she'll have a Blizzard." 'The Fresh Start' Terminal: "One scotch with ice, one Blizzard, coming up." Carter: "We had some excitement after you left, uh, we had a chance at the 'Bureau Burner'... at least, we think it was the Bureau Burner, anyway. Unfortunately, I had Murray sitting in as my controller." Theora:"I suppose the next thing you're going to tell me is I've been fired." Carter:"Murray seems to think so, yeah. But I don't." Carter:"How come you never mentioned you had a brother?" Theora:"There are lots of things I've never mentioned about myself. Twelve years spent in state homes cures you of any need to think back on the good old days." Theora: "My brother and I were separated - I suppose people are more likely to adopt pretty young girls. Anyway, I got lucky and he didn't. He's never forgiven me for leaving him. He wants nothing to do with me." Jack Friday: "You and I have been, uh, discussin' this rakeboard legislation for several months now. Now, you are gonna help us get it pushed through, aren't you?" Simon Peller: "I'm working on it, Jack, really I am, but, uh, you know how slow the decision-making process can be. I'm spending lots of time with my colleagues on the legislature." Ped Xing: "Zik-Zak will be investing substantial sums of money in the marketing and promotion of this game, Mr. Peller." Max: "Forget about that mad bomber jazz and listen up! 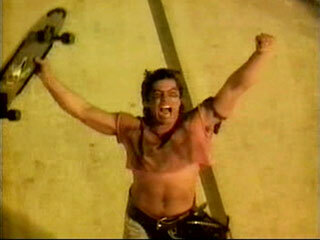 There's a guy with a gun running amok-mok-mok in a crowd here every afternoon!" Murray: "I'm sorry to disappoint you, uh, Max, but that's, uh, 'Missile Mike.' It's one of our children's shows." Murray: "I'm never going to get used to this. Just because he lives in a TV, he thinks everything is TV!" Max: "Wel-Wel-Wel-Well, nobody wanted it, so here it is!" Max: "This is Max Headroom, live on Net-Net-Net-Network 23, because what I want to know is, who's gonna stop this kind of wholesale killing-ing-ing-ing. Killing. It's time the network took a stand - a stand - a stand on this kind of murder. Murder. Murder. Preferably against it." Miss Julia Formby: "Seems that we have a new and exciting... race game, called...raking. If Jack Friday's right, we may have the biggest thing since ScumBall." Max: "I sense a prob-prob-prob-problem here! Why the long face? Hmm? Hmm?" Theora: "I think I lost my brother." Max: "Have you ch-ch-ch-checked your pockets?" Theora: "Max, it's not funny." Max: "Is there anything I can do to help? I mean, I mean, oh, what domen do when ladies are in distress - distress - distress - distress?" Theora: "Run away or... boast, normally." Max: "I wonder what Edison would do. He would be: A, concerned; B, anxious; C, distressed and D, sorry." Theora: "Yeah; he would also interfere." Grace: "He's taking a nap." Carter: "I'd... like to talk to him." Grace: "I said, he's taking a nap. Now, do you want to move along?" Carter: "Well... I feel certain he'd talk to me if he wasn't taking a nap, but if he is taking a nap, then I WOULDN"T WANT TO WAKE HIM!" Rik: "The kid's in trouble. Raking is brutal. The punters bet on survivors, not winners. You get me?" Carter: "Yeah, I'm beginning to." Rik: "Gracie... don't do anybody I wouldn't do. See ya for tea." Announcer: "The space shuttle orbit-thon got off to a good start today. Over sixty shuttles are now in Earth orbit, and the passengers have pledged over 184 million units towards the privatization of the global satellite..."
Background: "Rat meat to be had!" Theora: "Edison, I have him. Turn left." Carter: "Nice to have you back!" Theora: "Who says I'm back?" Raker: "Huh? Oh, it's you again!" Max: "Look - look - look, we're old friends! Raking! What's it all about?" Raker: "Raking? It's about survival. And that's all I know." Max: "You know enough. Thanks-s-s-s-s... old friend." Raker: "How did you cut me off like that?" Rik: "We got friends in high places." Theora: "Edison, Murray's here. I've told him you have the lead for our feature story this week. Can you give him the angle, please?" Carter: "Raking. It's called a sport. In fact, it's a vicious exploitation of kids who are encouraged to hurt each other for the pleasure of the audience." Murray: "All right. Let's run with it." Theora: "Okay. Now tell me the truth. Is my brother in there?" Carter: "Yeah. I'm... afraid he is." Promoter: "Hi there, Shawn. How ya doin'?" Shawn Jones: "I'm fine. Look... I'm fine. I'll go for it, sir. I'll wreck 'em for ya." Promoter: "Ah, what spirit! Eh, Dusty? One of raking's finest!" Rik: "Whaddya want to know now?" Carter: "I want to know how to get into that rake track." Carter: "My, oh, my, what a fascinating little gathering. Theora, get Murray." Murray: "I'm, uh, I'm here... Peller! Now that's what I call news! All right, stay on it, Edison. I'm going to get Cheviot." Promoter: "Ah... good timing. Novo Zurich confirms Zik-Zak has transferred the funds into our accounts. It seems our presence is no longer required here." Dusty: "Yeah, they're Network 23's problem now." Max: "Hey! *psst! * You look - you look - you look - you look like theman in charge. I'm looking for a new game - som-som-som-som-something with action, excitement and taste... taste... the taste... of blood. Any ideas?" Carter: "This is Edison Carter, coming to you live and direct..."
Theora: "The camera's down, Murray." Max: (crashes through window) "Ah. Ah. Didn't feel a thing. Ed-Ed-Ed-Edison! ...now what?" Carter: "Take it away, Max - it's all yours!" Max: "This is Max - Max - Max - Max Headroom live and direct, sitting in for... Edison Carter. We're here in the middle of a rake track, a sport - a sport - a sport - a sport which maliciously exploits young kids who would rather be watching the unlikely exploits of... Missile Mike." Max: "But as a famous personality once said... 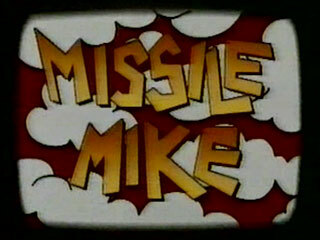 I think it was me... enough - enough of Mis - enough of Missile Mike." Shawn Jones: "I've never seen myself on TV before... but I suppose you get used to it." Carter: "Yeah. Eventually. (baby cries) You ever get used to the sound of babies?" Carter: "Practice could make something perfect!" Max: "And-And-And I'm going to be back with you on Network 23 after these real-real-real-really exciting messages. So-So sit back and watch - I just can't wait-wait-w-wait to see them!...wake me up when they're finished, willya?" Max: "Hi... this is M-M-M-Max Headroom on Network 23, and if you thought raking was a vicious game, let me tell you - there are sponsors who'd give both-oth arms to get their hands on that sport!" Max: "But... in a lighter vein, here are some really sporting off-off-offers on sale now from Network 23. Yes: music! Mu-Mu-Music! Sit back and tap your feet to the best Russian pop music with this really up to the minute Rus-ss-ssian album" '20 Great Funeral Marches!'" Max: "Also...also-also-al-al-also an offer, learn Chinese. Yes! A complete set of hour-long Teach Yourself Chinese tapes - one payment down and we will send you one tape per month, or, or, pay in full now and you get the entire easy-to-follow course immediately... plus! Tape number 527 absolutely free!" Max: "Did you know that, in Chinese, there are often more than thirty-thirty-thirty different ways of saying one simple little word? And is that why their population is so big? Chinese men just don't know when to take No... No for an answer!" This page was last modified on 19 December 2015, at 17:28.